Sedalia, Mo. 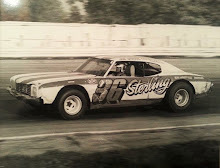 (August 29, 1976) – “Super” Joe Wallace doesn’t mind summer reruns – especially when they come in the form of back-to-back IMCA late model stock car feature wins. The 11-year veteran out of Kansas City returned to the Missouri State Fairgrounds on Saturday, fresh from an August 22nd victory on the half-mile oval, to win the 100-lap stock car main event on the mile track. 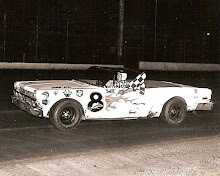 But for Wallace, who took the lead on the 63rd lap, the race became reminiscent of the previous week when, two laps later, he again found Lampe’s Ferris Collier hugging his tailpipes and preparing to slip by and take the lead. It Was Collier who posted a strong second-place finish behind Wallace a week earlier. Wallace was successful in holding off Collier the previous week and it appeared that he would do so again on Saturday until the 90th lap when Wallace slid high into turn two and Collier was able pass him on the back straight away. 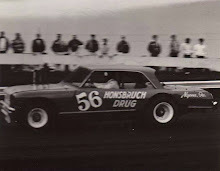 The front-running Camaro’s raced wheel to wheel through turns three and four and down the grandstand straight away but it was Wallace edging out Collier as they entered turn one for the 91st time that afternoon, regaining a lead he would never again relinquish. Wallace took the checkered flag nine laps later with Collier still glued to his bumper. "The track was getting harder and slicker all the time," Wallace said following the race, explaining the temporary lost lead. "The car hit a hump, the rear end of the car got up high and Ferris (Collier) got by." Asked if he was confident he could regain the lead he had lost, Wallace said, "Oh no. Ferris runs awfully strong. I wasn't confident I could pass him until I did it." 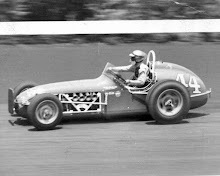 Mike Dibben of Kansas City, an early leader in the race, finished third in the grueling 100-miler that saw only 12 of the original 30 starting cars finish the race. 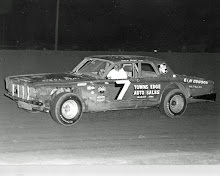 Mike Derr, a veteran driver out of Keokuk, Iowa, placed fourth, followed by Kansas City's John Oswalt, fifth, and Jefferson City's Eddie Gray in the sixth spot.